Taking the on-demand Leaf Live set up a notch, 2016 Leaf iCard trading cards offer a premium element for limited-time releases. Every card includes an autograph or game-used memorabilia piece. Touching on multiple genres, 2016 Leaf iCard promises cards from the worlds of sports, entertainment, politics and more. Just like Live, 2016 Leaf iCard has a selling period of one week and only the amount ordered during that period will be produced. Every direct order also offers free shipping in the Continental United States. Following the end of sales, each print run will be revealed. The solicitation provided by Leaf indicates the price for the first card is $59.99. 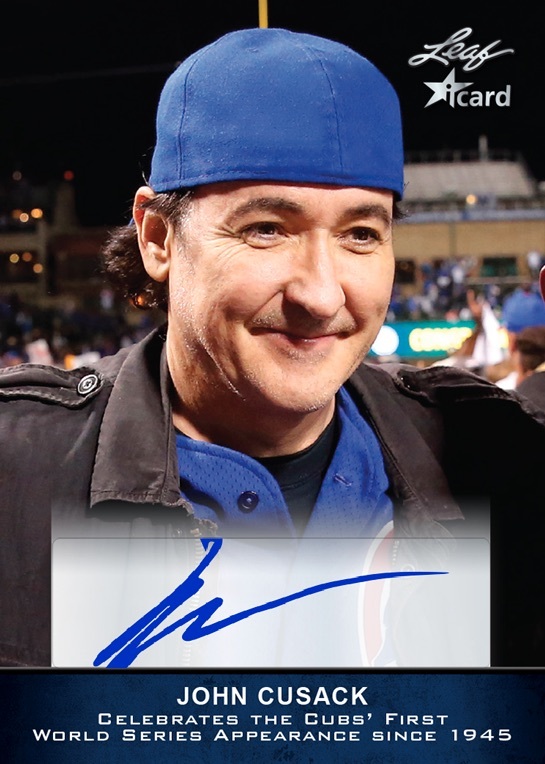 This card is essentially the signed version of famous actor John Cusack's Live card celebrating the Cubs returning to the World Series. It was not specifically stated but the mock-up image appears to show a sticker autograph. It is likely the price will change based on the subject and whether the card is signed or features a relic. While Leaf was vague in explaining the frequency of new releases for 2016 Leaf iCard, they did confirm that "cards will occasionally be added to this ever growing collection." This move to include autographs and relics is reminiscent of Topps Now Baseball and Panini Eternal, which both offer similar options in a real-time set. The 2016 Leaf iCard checklist tab above houses all announced cards for the on-demand set. The guide will be regularly updated as new cards are released. Print runs (PR) will be added when known.